The correct diet for a tortoise is high in fibre and calcium and low in fat and protein. This is best highlighted when we look closely at the diet of tortoises in the wild. Studies show that these tortoises graze on grasses, eat various plants, flowers, buds and roots all providing a protein and fat free diet. What tends to happen with captive tortoises, they are introduced to our own types of foods and because they are normally high in sugar and protein, they taste better. Unfortunately in the past tortoises have been fed on dog and cat food, bread, cheese, milk and list is endless. This type of diet is totally unnatural and the tortoise will suffer the consequences of a poor diet by firstly showing outward signs such as a lumpy shell and being overweight. The long-term damage is much more worrying with liver and kidney failure. 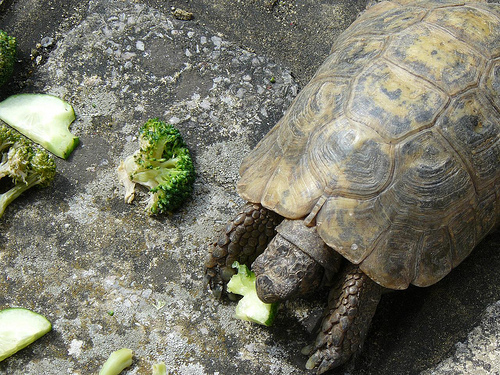 In order to provide your tortoise with a good diet, think of low fat and high in fibre, weeds and course green vegetables, herds and edible plants are ideal. For a full list of foods to offer and poisonous plants, we refer you to our Feeding Manual. All food offered should be washed and a food supplement can be applied every 3rd day to ensure the tortoise is getting the correct amount of calcium in their diet. For more information about feeding tortoises visit this website.